Hi, is there a plugin the same as the image below? The roller (I don't know what it is called) only shows if the tabs cannot fit the size of the container. The left and right arrow moves the tabs and the down arrow displays the tabs and you can choose a tab. The sub tab will be display the same as the image. 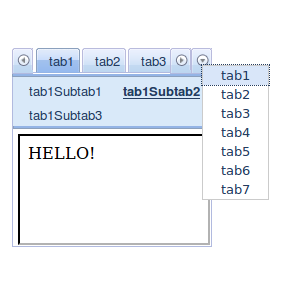 same tab feature as this scrolling tab, anyone?